I discovered another fun upcycle/recycle project – making beads out of scraps of paper that have been painted with glue and rolled like crescent rolls. 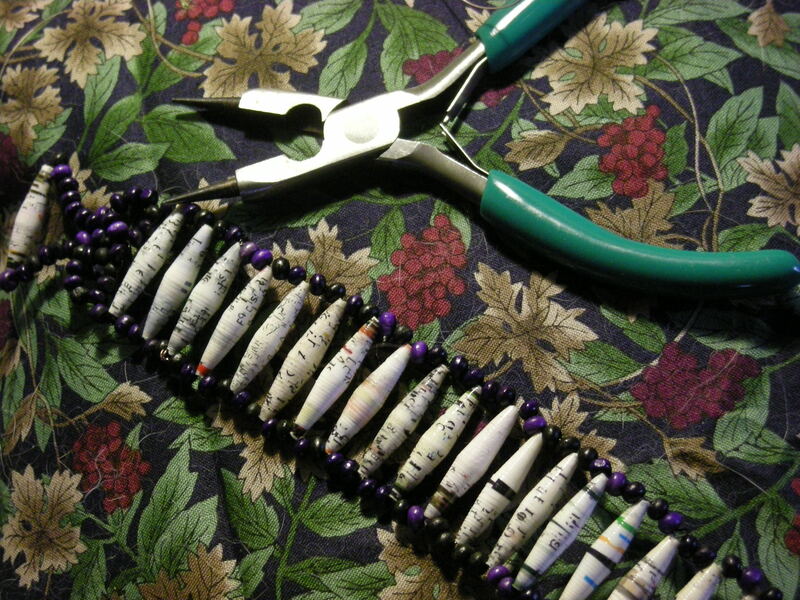 No, I didn;t make these beads but I was thankful to find 2 strings of them in the closeout bin at Pat Catans. But this is something on my Art Project Bucket List!!!!! So now what to do with these little beauties? Make a bracelet was my first thought. Here is the outcome. This offers me another way of how I can recycle all the crazy scraps of paper I have been collecting… might be a small adventure during the summer. Tell me what you think or if you have design ideas for using these beads. And just a reminder that we will be in the town square at Burton tomorrow from 10a-5p for the Saturdays in the Country event. If you are around stop and say hi!